I really hope you haven’t come to this page because you’re searching for “free Dina James ebooks” or anything like that. If that’s the case, it probably won’t do me any good to ask you not to steal from me, but on the off-chance that you’re willing to listen and not click the “back” button to continue your search to find copies on sites I haven’t yet sent take-down notices to, I’ll go on. Still here? All right then. Good, this page was written specifically for those who are willing to listen. If you’re a writer looking for info on how to deal with e-pirates of your work, you want this page. I should note that this page is not directed at those loyal readers who would never dream of pirating my work, or those readers who obtain electronic copies of my work legally through my publisher. I should also note that I’m not talking about “hot Johnny Depp on a ship with Orlando Bloom” piracy, just so you know. I probably should have just titled this page “Preaching to the Choir,” because the only people likely to read this are those who wouldn’t dream of pirating my work, but just in case you are (or someone you know is) one of the people who doesn’t get the fact that downloading copies of my (or any other writer/musician/artist’s) work is stealing, read on. I’ll start by doing something that should always be done. That is, I’m going to give credit to the people who have helped me with this – NOT claim I’ve done it all myself. In addition to this, I have asked each one of these writers for permission to use their work (they put work into these pages – wrote them – so if I took it and used it without permission, it would be stealing, no matter if I wasn’t making any money off it), and they have all kindly consented. On this page you’ll find articles and links provided by Patricia Briggs and her husband Mike, Shiloh Walker, and Skyla Dawn Cameron. So, are you getting it now? When you upload or download a file from a torrent site, especially a book, you’re stealing. You might not think you are, but that’s what it is, plain and simple. Now, if you want to argue, don’t bother. I’ve heard them all, and the other writers above have addressed each and every one of those arguments. I’m not going to repeat what they say. In my opinion, there ISN’T ANY ARGUMENT. It’s wrong. Period. It’s theft. Period. You’re taking what’s not yours, and you’re taking it from the person who wrote it. It’s not “lending” or “archiving” or “sticking it to the man,” or anything else you want to use to justify it. Now, maybe you’re not the type who would come into my house and take anything. You wouldn’t steal my car or even a pen off my desk. If that’s not you, then why are you stealing my work? Why are you letting your brother, or your friend steal from me? Would you let them come into my house – or yours – and do that? Because that’s what they’re doing. Again, spare me the “yeah but” speeches. There’s no justification you can make for up-or-downloading copies of my hard work. HARD work. Yeah, that’s my work. If you want me to continue working, providing you with stories to enjoy, then HELP ME do that. Don’t up-or-download my – or any other person’s – work. Talk to your friends and family who do it and teach them that it’s wrong, and it HURTS. Now, if you’re the kind of person who doesn’t care about hurting someone else, then you probably haven’t even made it this far on the page. But if you’re not that kind of person, thank you for listening, and for your help. 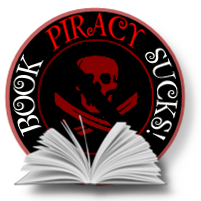 Lilith Saintcrow also has some great advice on piracy and pirating. Jeaniene Frost has also given me her kind permission to link to this great article on Deadline Dames she wrote regarding the subject.